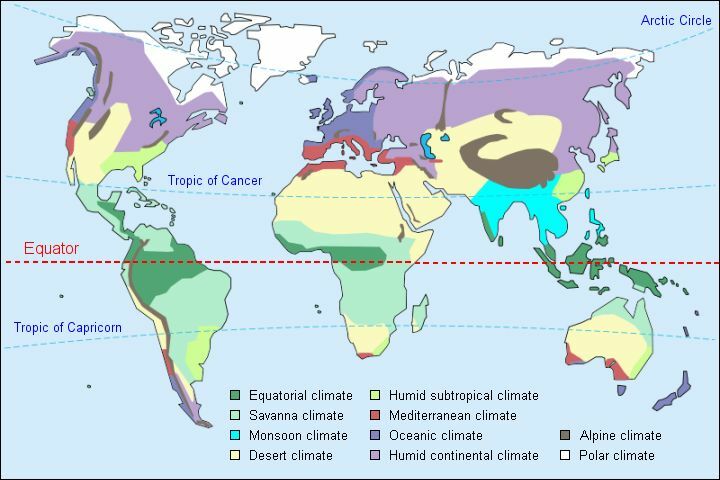 Weather is influenced by many climate variants produced in different time zones by different winds, causing climatic changes due to the movement of air flow across different longitudes and latitudes. The national and other popular cities’ weather can easily be accessible by clicking the icon below. Mostly generated from the oceans’ open air moving inlands. The study of climate weather changes is called Meteorology. 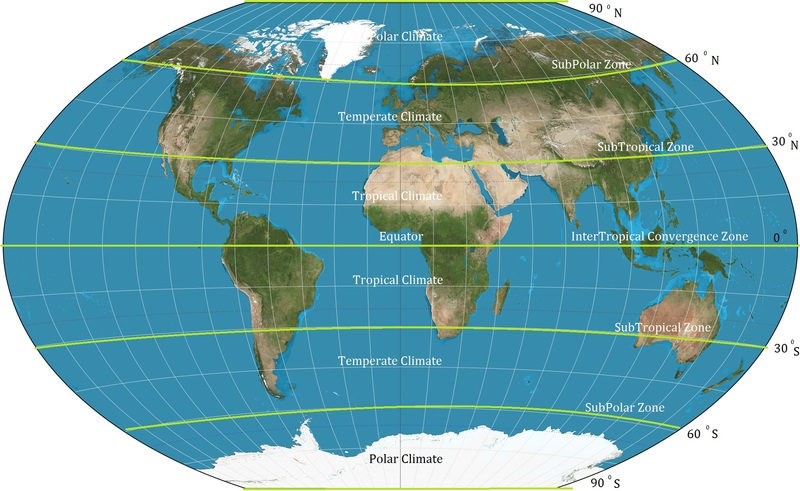 Depending on the season and period of the year, these weather zones do experience temperatures ranging from frozen to hot tropical temperatures caused by polar to tropical winds and Temperate climates caused by Monsoon winds. The diagram below illustrates the different pattern of climate experienced globally. Meteorology is the study of the atmosphere, atmospheric phenomena, and atmospheric effects on our weather. The atmosphere is the gaseous layer of the physical environment that surrounds a planet. Earth’s atmosphere is roughly 100 to 125 kilometers (62.1 – 77.7 miles) thick. Gravity keeps the atmosphere from expanding much farther. Meteorology is a subdiscipline of the atmospheric sciences, a term that covers all studies of the atmosphere. A subdiscipline is a specialized field of study within a broader subject or discipline. Climatology and astronomy are also subdisciplines of the atmospheric sciences. Climatology focuses on how atmospheric changes define and alter the world’s climates. Astronomy is the study of the upper parts of the atmosphere, where unique chemical and physical processes occur. Meteorology focuses on the lower parts of the atmosphere, primarily the troposphere, where most weather takes place. Meteorologists use scientific principles to observe, explain, and forecast our weather. They often focus on atmospheric research or operational weather forecasting. Research meteorologists cover several sub disciplines of meteorology to include: climate modeling, remote sensing, air quality, atmospheric physics, and climate change. They also research the relationship between the atmosphere and Earth’s climates, oceans, and biological life. Forecasters use that research, along with atmospheric data, to scientifically assess the current state of the atmosphere and make predictions of its future state. Atmospheric conditions both at the Earth’s surface and above are measured from a variety of sources: weather stations, ships, buoys, aircraft, radar, weather balloons, and satellites. This data is transmitted to centers throughout the world that produce computer analyses of global weather. The analyses are passed on to national and regional weather centers, which feed this data into computers that model the future state of the atmosphere. This transfer of information demonstrates how weather and the study of it take place in multiple, interconnected ways. Weather occurs at different scales of space and time. The four meteorological scales are: microscale, mesoscale, synoptic scale, and global scale. Meteorologists often focus on a specific scale in their work. Microscale meteorology focuses on phenomena that range in size from a few centimeters to a few kilometers, and that have short life spans (less than a day). These phenomena affect very small geographic areas, and the temperatures and terrains of those areas. Microscale meteorologists often study the processes that occur between soil, vegetation, and surface water near ground level. They measure the transfer of heat, gas, and liquid between these surfaces. Microscale meteorology often involves the study of chemistry. Tracking air pollution is an example of microscale meteorology. MIRAGE-Mexico is a collaboration between meteorologists in the United States and Mexico. The program studies the chemical and physical transformations of gases and aerosols in the pollution surrounding Mexico City. MIRAGE-Mexico uses observations from ground stations, aircraft, and satellites to track pollutants. Mesoscale phenomena range in size from a few kilometers to roughly 1,000 kilometers (621.4 miles). Two important phenomena are mesoscale convective complexes (MCC) and mesoscale convective systems (MCS). Both are caused by convectional winds, an important meteorological principle. Convection is a process of circulation. Warmer, less-dense fluid rises, and colder, denser fluid sinks. The fluid that most meteorologists study is air. (Any substance that flows is considered a fluid). Convection results in a transfer of energy, heat, and moisture—the basic building blocks of weather. In both an MCC and MCS, a large area of air and moisture is warmed during the middle of the day—when the sun angle is at its highest. As this warm air mass rises into the colder atmosphere, it condenses into clouds, turning water vapor into precipitation. An MCC is a single system of clouds that can reach the size of the state of Ohio and produce heavy rainfall and flooding. An MCS is a smaller cluster of thunderstorms that lasts for several hours. Both react to unique transfers of energy, heat, and moisture caused by convection. The Deep Convection Clouds and Chemistry (DC3) field campaign is a program that will study storms and thunderclouds in Colorado, Alabama, and Oklahoma. This project will consider how convection influences the formation and movement of storms, including the development of lightning. It will also study their impact on aircraft and flight patterns. The DC3 program will use data gathered from research aircraft able to fly over the tops of storms. Examples of blizzard snow weather are common in Midwest region of the United States of America which is located close to Canada where they experience polar climate conditions during winter season. Below, is a photo taken during such weather. Minneapolis was covered by a heavy blizzard snow storm throughout the week-end with recorded snow fall on February 10th, 2013. The roads were all covered with 4-6 inches of snow and poor visibilities in neighboring suburban cities close to the twin cities. Temperatures were recorded above freezing points, keeping teens and parents shoveling driveways and sidewalks. Some of the children had fun building snowmen and dramatic sculptures.